Updated 3/13/19 ~ We do ❤️ Disney Cruise vacations! 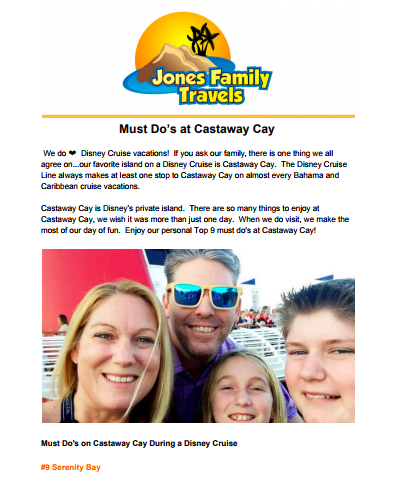 If you ask our family, there is one thing we all agree on…our favorite island on a Disney Cruise is Castaway Cay. The Disney Cruise Line always makes at least one stop to Castaway Cay on almost every Bahamian and Caribbean cruise vacations. Castaway Cay is Disney’s private island. There are so many things to enjoy at Castaway Cay, we wish it was more than just one day. When we do visit, we make the most of our day of fun. Enjoy our personal Top 9 must do’s at Castaway Cay! Serenity Bay is the adult only area on Castaway Cay. When the kids want to go into Children Programming, we go to Serenity Bay. You can rent a cabana, get a message on the beach, join the yoga class, or just enjoy the peace and quiet of this kids free zone. This adult only beach has lots of beach to wander and search for starfish! Look for a thrill? Try one of the twisting water slides. You will have to swim out to Pelican Plunge, so make sure you grab a life jacket for your little ones before you go. No need to get back on the ship for lunch. Just walk over to Cookies BBQ or Cookies Too for ribs, chicken, corn, hot dogs, hamburgers, ice cream, and more. This is one of our favorite meals during a Disney Cruise! This is a hidden gem that is often missed at Castaway Cay. Rent a bike and ride along the bike trail to the observation tower. If you are running the 5K, take a minute and climb on up. It is a fun break during your run and the view is absolutely amazing! Castaway Cay has its own special postmark and stamps. You can mail a postcard to let everyone know how much fun you’re having on vacation. You may also run into some of your favorite Disney pals for a quick photo. This is the youth activities area on the island. You can drop off your kids with the Disney Counselors and they can participate in activities like whale digging at Monstro’s Point. There is a huge snorkeling area at Castaway Cay. There are even marks to help you find sunken ships, Minnie Mouse, and even Mickey Mouse under the water. We saw all kinds of fish and even a sea turtle during our last adventure at Castaway Cay. Ready for an adult beverage? The conch cooler is delicious! Check your personal navigator for drink specials. You can usually find an offer of 2 for 1 drinks. The Conched Out Bar is tucked away near Pelican Plunge and has a great view of the snorkeling area and Disney Cruise ship. Pick up your Castaway Cay merchandise at this location. You can find sand toys, t-shirts, beach towels, 5K merchandise, and so much more. You just use your Key to the World card to purchase any souvenirs. Take a break from the sun and enjoy this pavilion where you can play basketball, billiards, ping-pong, shuffleboard, and more. This is a lot of fun for the whole family. If you feel like soaking up some more Disney Cruise, be sure you check out our Disney Cruise playlist on YouTube with over 80 videos! Do you have a favorite spot on Castaway Cay? What is your favorite? 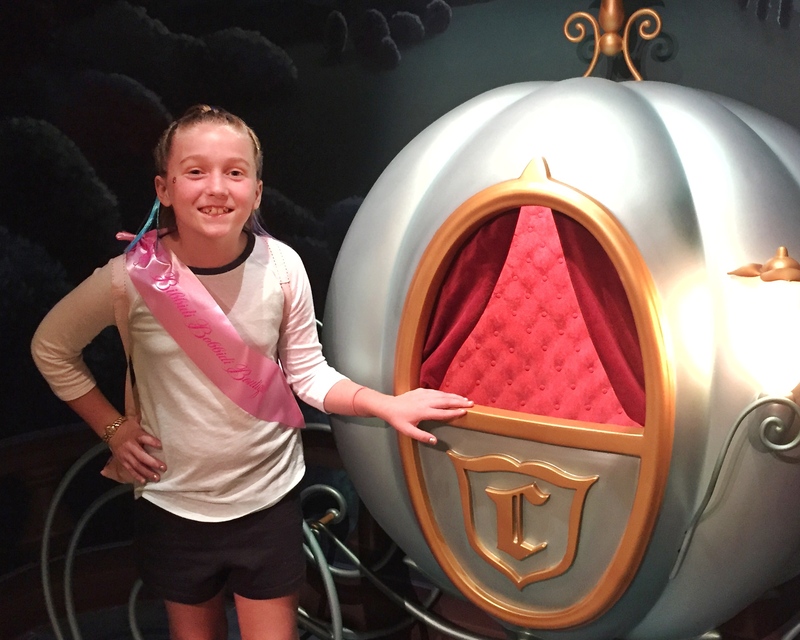 Disney Magic Christmas Cruise Fun!